A few weeks ago I blogged about my favorite soy ice cream, and a handful of people wrote in to ask if I had any non-soy ideas for a low calorie, but smart ice cream substitute. I followed up with a post on an amazingly yummy ice cream sandwiches, and today I want to follow up again and tell you about a few yummy flavors of Dryers Slow Churned Yogurt Blends. 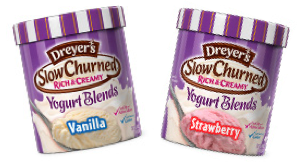 I love eating Dryers Slow Churned Frozen Yogurt. The portion size is very big because the yogurt is really fluffy (I adore fluffy ice cream), so 59g goes a long way. Also, the calories and fat content are low because it is frozen yogurt instead of ice cream. As an added bonus, each serving contains 10% of the recommended daily value of calcium as well as the live and active cultures that you get from eating regular yogurt (that help regulate digestion and are believed to help protect against bacterial infections). There are tons of wonderful yummy foods that you can mix into this yogurt to add crunch or additional flavor. For instance, you could add soy nuts, a handful of low calorie cookies, fat-free whipped cream, dry fruit, fresh fruit, or frozen fruit. Sometimes I weigh out half a serving of frozen yogurt on my food scale, and then I combine it with half a serving of soy ice cream for flavor variety. Strawberry: 100 calories per serving, 2 WW points -- My Personal Favorite! You can buy the Yogurt Blends in most supermarkets. I buy mine at Safeway. Beware of the other ice creams and frozen yogurts that are placed around it in the freezer section. If you find one with ingredients like sucralose, high fructose corn syrup, aspartame, or hydrogenated oils, put it back and look at the next one to see if it is better. With ice cream/frozen yogurt, I've found that the ingredients don't just vary based on brand alone, as it can vary based on flavor (like with the yogurt featured today). Also, I've noticed that ingredients in the mainstream low calorie ice creams and frozen yogurts seem to change periodically, so make sure you re-check your ice cream or frozen yogurt label every couple of months. I love frozen yogurt. My favorite is Stonyfield Farms Creme Carmel frozen yogurt. This is SO good even my husband who is totally anti-"healthy" loves it. Also, it comes in a small container so you don't have to have a half gallon in the freezer. Yum! Thanks tamga33, I'll check it out.